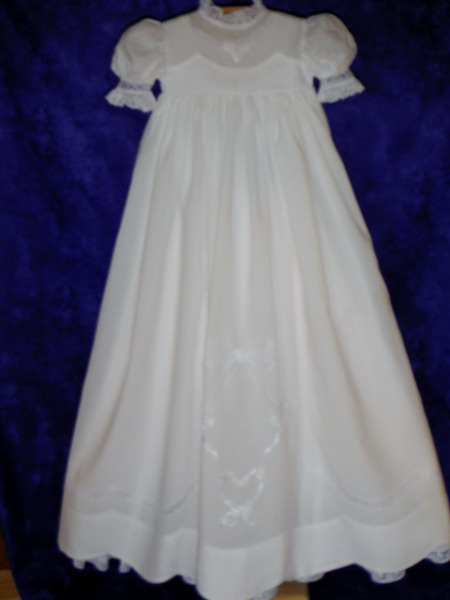 Aiden's Choice is the perfect christening gown for a boy. This ensemble of Swiss cotton batiste fabric consists of a bubble suit with a removable skirt, both ornamented with shaped bias strips of blue batiste and machine-embroidered crosses (this allows for a more formal and traditional outfit for the christening and after the ceremony, provides your baby with a lovely little bubble suit to wear separately). Sleeves are short, cap sleeves with cuffs trimmed in blue batiste piping, which also trims the collar. 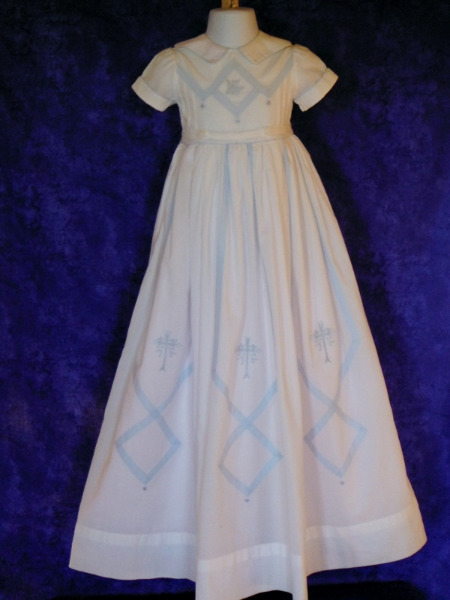 A choice of design, stitched in either white or blue, adorns the center of the yoke bias shaped design. The piped waistband of the full, gathered skirt with slip is attached to the bubble suit with four buttons. The back yokes of the bubble suit are fastened with four buttons. The leg openings of the bubble suit have casings through which elastic is run; a crotch placket is fastened with three buttons. For a more gender neutral appearance, choose ivory or soft yellow accents. An exquisite christening gown in antique white silk dupioni with a fully smocked bodice, simple puffed sleeves and an inset scalloped hem outlined with gimping. The sleeves are embroidered with the delicate rosebuds that gave the gown its name and the same embroidery finishes off the soft pink diamond smocking. Embroidered bouquets of rosebuds accent the inset scalloped hem and the gown closes up the back with tiny round pearl buttons. White batiste with white linen madeira bodice and hem. A ruffled lace trimmed neckline enhances the delicate tone-on-tone embroidery on the bodice. The same ruffled lace with beading trim the puffed sleeves. A lavish lace shaped bow that extends into scallops above the madeira hem adorns the front of skirt along with more ribbon and bow tone-on-tone embroidery. A beautiful lace trimmed slip completes this ensemble. 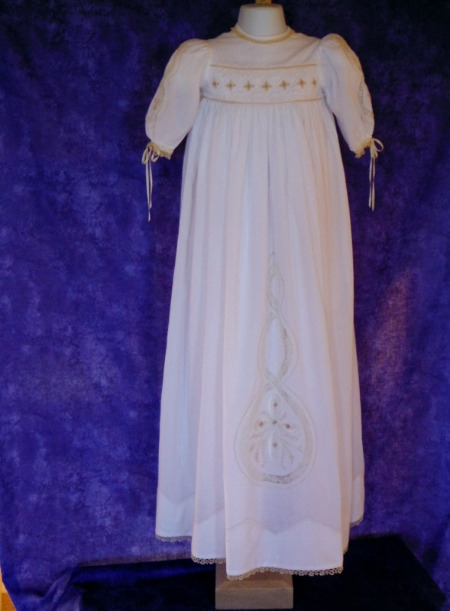 This lovely christening gown in ivory batiste, features a bound neckline trimmed with ecru tatting on a bodice with a piped and heavily smocked insert. An ecru lace shaped celtic trinity ring motif embellished with a lavishly embroidered celtic cross is the centerpiece of the full gathered skirt. Smaller lace shaped motifs and embroidery are the focal point on the long sleeves trimmed with ecru tatting and ivory silk satin ribbons. The simple hemline is trimmed with more tatting and outlined with ecru gimping. To complete the outfit, a beautiful slip with shell edging on the neckline and armholes and a hem edged with wide ivory silk satin ribbon. A gorgeous, front opening christening suit of the softest Swiss cotton flannel. Ecru smocking decorates the fronts and back of the jacket. A little bow sits neatly at the top of the front button band. The long sleeves, Peter Pan collar and button bands are piped with self piping. The cuffs of the long legged pants are also trimmed with self piping.